Students pursue flying with help from the Ninety-Nines. Happy Students — Stephanie Luongo, an employee of the National Test Pilot School, and Erin Hambrick, an employee of Scaled Composites, are recipients of scholarships provided by the Ninety-Nines, a non-profit organization established in 1929 by 99 licensed woman pilots for the support and advancement of aviation. Both pilots will use their scholarships to advance their training and pilot skills and dreams. 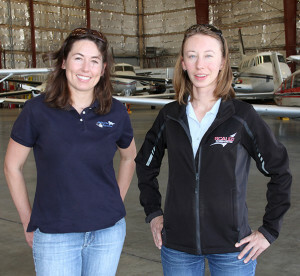 Becoming a pilot and inspiring others to fly, especially young females, is a dream come true for both Stephanie Luongo, 33, an employee of the National Test Pilot School, and Erin Hambrick, 32, an employee of Scaled Composites. With scholarships provided by the Ninety-Nines, an International Organization of Woman Pilots, they are advancing their skills and encouraging others to do the same. Hambrick won the Ozzie Levi Memorial Scholarship from her local Antelope Valley 99s Chapter, which will help her achieve a commercial license. “I am so grateful for the 99s, they have done so much for me,” said Hambrick. Inspired by her grandfather who was a machinist and built model airplanes, Hambrick dreamt of flying, especially huge, military aircraft; however, due to her poor eyesight, she thought flying was impossible at all levels, so she decided to do the next best thing — to design them. Attending an air show in Camarillo, Calif., while pursuing an aeronautical engineering degree at Cal Poly, she watched a formation of T-6s and other planes. The announcer said that they were all female pilots from the 99s. “I was really impressed of all the female pilots doing such a great job,” recalls Hambrick. Connecting with the local San Luis Obispo 99s chapter on-line, she explained that she was not a pilot but studying to be an aerospace engineer and thought she should talk to a few pilots before she was turned lose to design aircraft. “Do we have things we can share with you!” the 99s informed Hambrick. Hambrick went into accelerator mode with a few lessons a day and went from solo to check ride to finish her license over senior year spring break. Working developmental flight test for Lockheed Martin on the F-35 program at Naval Air Station Patuxent River, Md., was a dream job out of school, although, after five years Hambrick was longing for the flying weather in California and an opportunity to participate in prototype aircraft design. She is now working in Mojave on the Stratolaunch project, which will be the largest aircraft in the world. Her dream of becoming a traditional military pilot was unrealizable but she holds on to her passion for military aircraft, especially those from World War II. The flight training that she does on her own helps her to be a better aircraft designer and flight test engineer. Pursuing a commercial and ultimately a CFI rating would enable her to pay it forward, just as the 99s had done for her. “To be there, to share and encourage the love of flying, to build a community, and to provide others with financial help — that’s what it is all about,” says Hambrick. Stephanie Luongo was awarded the 99s Amelia Earhart Memorial Scholarship where she will receive full funding to obtain a Certified Flight Instructor certificate. As part of the application requirements, she created a detailed plan and budget for how she would achieve the CFI and submitted it to the International organization. Out of hundreds of applicants, she was selected. “I couldn’t be more excited and more thankful!” said Luongo. Fascinated with airplanes since she can remember, as a young girl she looked up at them and longed to be flying. On her first commercial flight she was amazed at how far she could see — “the beauty of the sky and earth, being able to see for hundreds of miles, was so amazing. I was definitely in it for the views,” explained Luongo. Born and raised in Reno, Nev., Luongo pursued a master’s degree in electrical engineering from University of Nevada while working full time for Sierra Nevada Corporation, an aerospace and defense contractor. Within eight months she had her private pilot’s license, and a few years after she continued her training by completing instrument and glider ratings. She transferred to Colorado and acquired her multi-engine rating while working as a flight controller and subject matter expert on the avionics system for the Dream Chaser spacecraft, which at the time was a manned lifting body in development for sending astronauts to and from the International Space Station and possibly serve as a replacement to the space shuttle. Boeing and SpaceX ultimately won NASA’s Commercial Crew contract but all was not lost. She was accepted at the National Test Pilot School in Mojave and is enrolled in the Graduate Assistant Program. “To me, my instructors are the guys straight out of ‘The Right Stuff;’ they are all incredible pilots and engineers. Sometimes I think we forget that they are normal people also,” she smiles. Luongo has applied with NASA to become an astronaut and is waiting on a response. “Going to space, to be an astronaut, is the ultimate dream. I know 500 amazing, qualified people apply and they can only choose 10, but I’m still hoping.” Meanwhile, she is quite content learning from some of the best teachers in the industry and sharing her love of flying with the 99s and future pilots.